For exactly 300 submissions, my Avg Vote Received is 5.8557, so statistically that will be the score of this image. Thank you for all the comments - y'all are incredible! Congrats tate for the closest guess of 7.17 which is 0.04 from my final score. 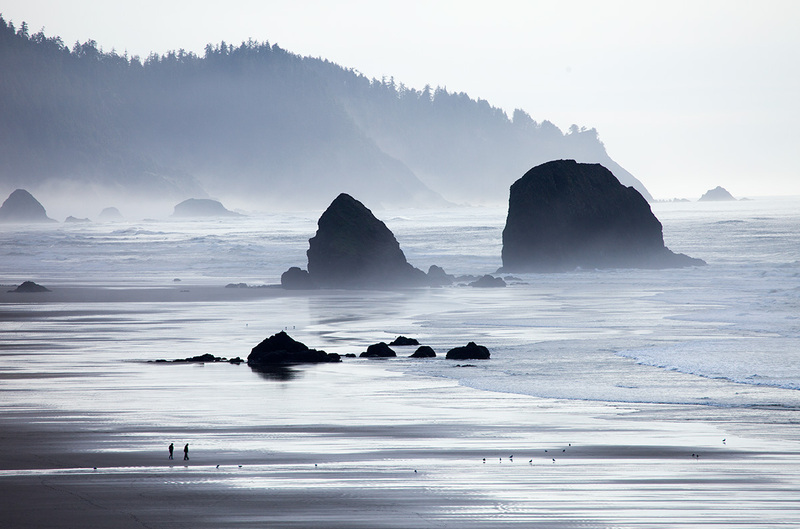 View more Oregon Coast photos like this! I'm happy your guess (and mine) were completely wrong. Congrats with the red! Congratulations on a beautiful shot and your red ribbon! Gorgeous spot, congratulations on your red. I miss the Oregon coast. You've done a magnificent job of capturing one of her more mysterious moods - the mist just slightly obscuring the rocky coast. I especially like the parallelism between the main land and the right main rock. And the solitary couple just adds a presence to the image. One of my two favorites in the challenge. I already like it for the scene, the mist, the depth. But the two figures make it. Great sense of scale. I hate the sensor spot - bet you do, too, by now LOL - and the sky looks blocky but I suppose that's a compression issue. It's still one of my top images and I'm staying with a ten. I think it will score 6.8 and would score higher without that spot. Picky, aren't we? Grand, 6 from me and a prediction of 6.32. I gave it a eight. Guessing a 6.4. I gave this an 8. I found this image very moving, especially with the scale of people versus rocks so clear. Plus the faded blues with a hint of fog, really nice. Modesty! I would say this will do 6.5 minimum. Beautiful scattered silhouettes of man, beast, earth and sky. Woah! I just saw the size of people to put it into perspective. This looks Oregon Coasty like. The teeny little people and even tinier birds create a reference for those monumental rocks. Really good and probably a high 6.67. I'll help with an 8. Beautiful and I believe it will finish higher. My prediction is 6.2. I love the scale of this picture. I love the two tiny figures really shows a sense of scale, I'm wondering if it would you would of been better off just cropping a quarter of the top off, not sure, anyway I'm bumping this up to a 7. Originally gave you a 5 first off. I'm guessing your score will be a little higher than your guess maybe 5.966.
this one feels like a 6.5 to me, simply because of the people and the birds. What a surprise on scale! The only thing that I wonder is: is the horizon tilted a bit? Probably my fav, but I'm still voting, so for now I can say a 9 from me and 6.80 from DPC crowd. I voted before looking at titles, now commenting. I think you are selling yourself short with that prediction, especially with the people and birds rounding out the image. I gave you a 7. Lovely scene. I predict 5.8. The first time around I had this in as a 6 then I noticed the people and bumped it to a seven. I like the scale of this. It looks so massive. I like this more than you do. Hello, I voted a few days ago, now returning for comments. I think that you really under estimated your score, this is my favorite in this Challenge and I gave you a ten. I predict that you will finish a full point above your prediction at 6.8557 and it should be a ribbon contender. Gorgeous scene. I hope this does better than you anticipated. 7.4 Serene land/seascape. The muted grays, blues and blacks (can black be muted?) beautifully contribute to this feeling. The composition and the procession of planes lending depth are well-handled. I especially like how the aforementioned procession goes from small in the foreground to huge in the background (not counting the sky) -- birds, people, smaller rocks, larger rocks, and jutting headland. .1 subtracted for sensor dust relic in the sky. Ridiculously humble or exceptionally bad at estimating how this would do. Cool tones, glimmering contrast, a story with two characters in the Pacific Northwest mist (I believe). Excellent stuff. Proudly hosted by Sargasso Networks. Current Server Time: 04/22/2019 02:18:52 AM EDT.